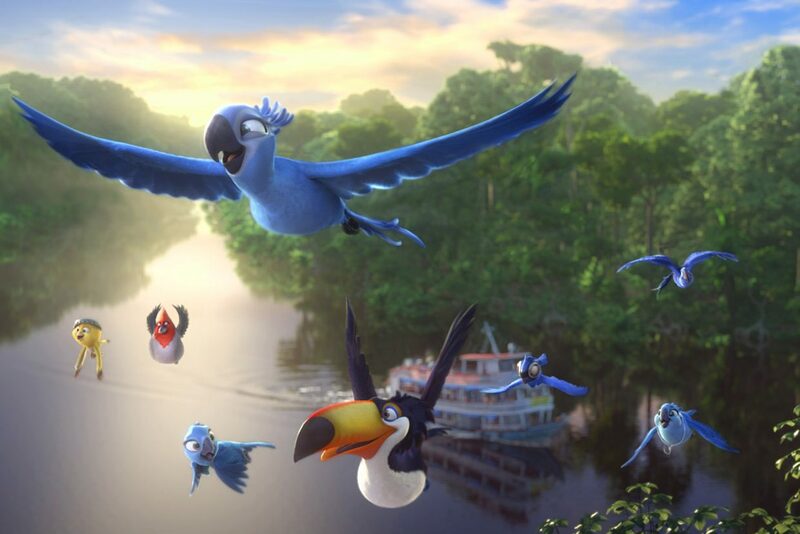 Spix's macaws Blu and Jewel (voices of Jesse Eisenberg and Anne Hathaway) and company soar along the Amazon in "Rio 2." The movie is a sequel to the 2011 animated feature about a pair of parrots who now find their species isn't as rare as they thought. 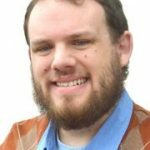 Everyone has a favorite ornithological cliché, whether it’s about birds of a feather flocking together or a bird in the hand being worth two in the bush. In the case of “Rio 2,” the appropriate saying seems to be “kill two birds with one stone” because having a second movie doesn’t make the first one any better. Spix’s macaws Blu and Jewel (voices of Jesse Eisenberg and Anne Hathaway) have got it made living in urban Rio de Janeiro with their three children Carla, Bia and Tiago (Rachel Crow, Amandla Stenberg, Pierce Gagnon). At least, that’s Blu’s opinion, while Jewel thinks their little nest has gotten a tad too domesticated. News that their species may not be as rare as they once thought leads Jewel to push Blu and the kids into accompanying her to the Amazon rainforest to see if this is true. Leaving behind the creature comforts of home for the wild is bad enough for the overly cautious Blu, but the dangers of the jungle are nothing compared to when he meets his father-in-law, Eduardo (Andy García), for the first time, immediately making a bad first impression on a bird that already distrusts humans and anyone who associates with them. Even worse is the fact that Blu and Jewel’s old enemy, the crazed cockatoo Nigel (Jemaine Clement), is seeking revenge and a group of loggers are threatening to tear down the macaws’ habitat. Eisenberg’s propensity for nervous mumbling and panicky exclamations again make him a good fit for Blu, barely any more stalwart than he was when we first him, the difference being he’s at least mastered flying by now. Still, most birds neither need nor want a GPS in their fanny pack. Come to think of it, a fanny pack looks just as touristy on a parrot as it does on a human. Hathaway’s exuberance is just as apparent when she’s playing a cartoon character with a beak, as the mom who wants her chicks — trendy Carla, bookworm Bia and daredevil Tiago — to have the same freedom she had before being stuck in captivity, fending off the advances of her old boyfriend, Roberto (Bruno Mars), much to Blu’s fury. George Lopez, will.i.am and Jamie Foxx return as the three amigos: Rafi the toucan, Pedro the cardinal and Nico the canary. The trio is looking for new musical talent among the Amazon’s animals, but their most promising prospect gets swallowed whole by a jaguar. Clement is even better as the maniacal Nigel, driven mad by his last encounter with Blu, helped along by a poison dart frog (Kristin Chenoweth) whose fawning personality is almost as toxic as her body chemistry. Leslie Mann and Rodrigo Santoro return as Linda and Tulio, Blu and Jewel’s owners, unexpectedly getting mixed up in the activities of a shady industrialist (Miguel Ferrer), who, like most animated eco-villains of the last couple decades, hasn’t learned the lesson that nature is awesome, a moral Hollywood feels the need to screech at us again and again. There’s nothing really wrong with this story of animals rediscovering their roots except that we’ve seen it before — a lot. When you’re talking about design, Blue Sky Studios does good work in the smart look and exciting motions of its characters, a winner here when it comes to the scene involving a showdown between the blue macaws and their scarlet rivals that looks like air soccer or Quidditch minus the brooms. Nobody’s arguing that something like this isn’t a hoot to watch in 3-D, but when it comes right down to it, none of these birds is all that intriguing, a reminder that you’ve got to work twice as hard to write animated characters so they’re relatable because the voice actors can only do so much. Behind the flashy plumage and loud music, “Rio 2” doesn’t have a lot going for it, proving the first feature was more than enough. Even so, the idea for a trilogy is undoubtedly already hatching in the minds of executives, so let’s hope they can make a third movie a little less bird-brained.